I have never heard of fudge be sent in for snack. I would be in trouble at Pierce's school. 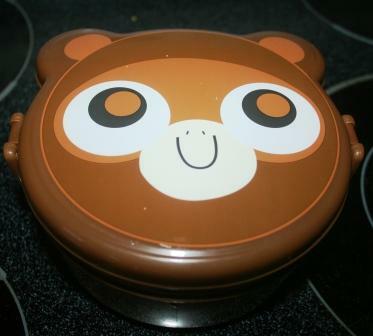 He is so cute :) And I love his bento box!! hee hee : ) the lunches you make are amazing!! i wanted to make homemade lunches too (had all these great ideas) but my husband made the decision the girls should have hot lunch at school each day (they have three choices daily, the meals are all planned by nutrionists). i was disappointed at first and concerned the girls wouldn't like them, eat enough, etc., but they LOVE hot lunch and i love even more not having an extra thing to do at night : ) i do send in their own little snack each day and don't even get fancy with that (ha). 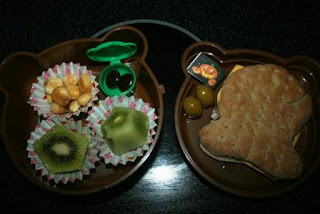 they do like the little notes i leave them ... but i am always impressed when i see such fun, clever and yummy looking homemade lunches : ) as for fudge for snack, interesting. I'm really surprised that his school allows homemade treats. We haven't been able to do that here in years. I've never heard of pumpkin fudge. Interesting. I've seen a lot of cold school lunches while working at school and yours are, by far, the coolest! That's the trouble with sending you kid to a chef's school LOL. Wow, the lunch sounds amazing, and I hope the creating goes well. We have one packer and one buyer--the little girl's (packer) tastes are pretty narrow right now. Lol! My daughter begs to bring a lunch from home every day. Your lunch looks great. Good luck with the fudge! Lol that's funny. Well not for you if you have to make the dreaded pumpkin fudge. I have no desire to make any type of homemade candy or fudge. LOL now see this is where that saying "be yourself because everyone else is already taken" comes in handy LOL ... Your snack could be the next big hit. oh the pressure!!! you must hunt down sean's mom and pay her to make some! You're an amazing lunch-making-mama.....you make me want to do better! Good luck with the pumpkin fudge! I've never heard of pumpkin fudge either. Oh the woes of parenthood! Love You! Oh the pressure! My kids should have had you as a mom! Oh no, snacks are competitive? ;) Wow that's an impressive lunch. My kids will be lucky to get a balanced lunch! His lunch rocks!!! Surely all the other kids must be jealous of it! You even out in some kind of little pumpkin picture. I will NOT make anything that needs a candy thermometer, just like you. So annoying! Sorry I don't know how to make the fudge, but I would bet you can find some that don't need a thermometer. I make a fudge that doesn't need one, I would think you could just add some canned pumpkin? Well, with 4 kids, and making lunches for them over the years I figured I’ve made about 8640 lunches…and counting…. I think you do it better than 99.99%. Your lunch for Pierce looks great. Will you make my lunches? If you ever do make this - I'd like a look at the recipe. Sounds very interesting, as long as it isn't orangeish. Wherever did you find goldfish shaped bread? well pumpkin fudge does sound interesting.. but never heard of it. I love the little lunch containers. Oh how I wish my kids were eat the school's lunches! lol I really don't like getting up in the morning and fixing lunches for them. I just don't like to smell food in the morning. Crazy I know... I have got to get some of that little fishy bread! That is just too cute! I have been sending the round bread for my daughter and she loves it. We aren't allowed to make anything homemade for parties for the kids at all. We aren't even allowed to cut up the fruit for a fruit tray! I went to a meeting yesterday morning with the Principal going over the rules for us homeroom moms. It makes having the parties for the kids cost just too much having to buy everything prepackaged and all. I'm a WAY bigger fan of chocolate fudge than pumpkin fudge! There were "those" types of moms when Amy was little too. I always thought they were show offs! Hahaha!! I don't even OWN a candy thermometer...I'm definitely no help to you. How about pumpkin yogurt? Do you think that homemade granola "bars" could be cut out with small pumpkin shaped cookie cutters? You are a wonderful Mother! Besides, pumpkin fudge doesn't even sound good. I have no doubt you will come up with a wonderful, healthy and creative snack when it is your turn. That is an AWESOME lunch & all the fun touches you put into it I'm sure do not go unnoticed!